I’ve got to write this down now, while I still remember what I did. Dan Sheffler has a great blog. Lots of really neat & useful stuff. One of the things he has is a script for exporting your notes and annotations of pdfs in nicely formatted markdown. (All OS, I’m afraid Windows folks). First two things we need: Skim: http://skim-app.sourceforge.net/ Bibdesk: http://bibdesk.sourceforge.net/ And a pdf of some academic article. Download and install Bibdesk. Open Bibdesk. Drag & drop your pdf onto the Bibdesk window. Add relevant metadata. 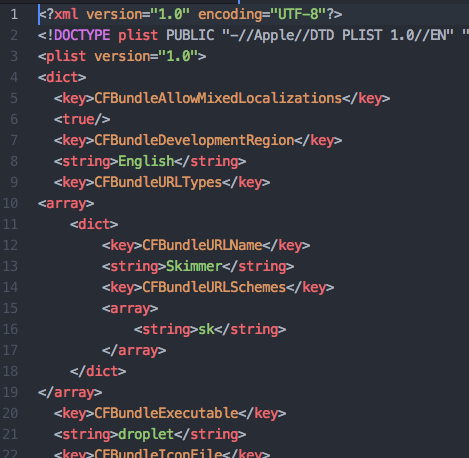 Crucial: the ‘Cite key’ field is like a shortcode for referencing all this. 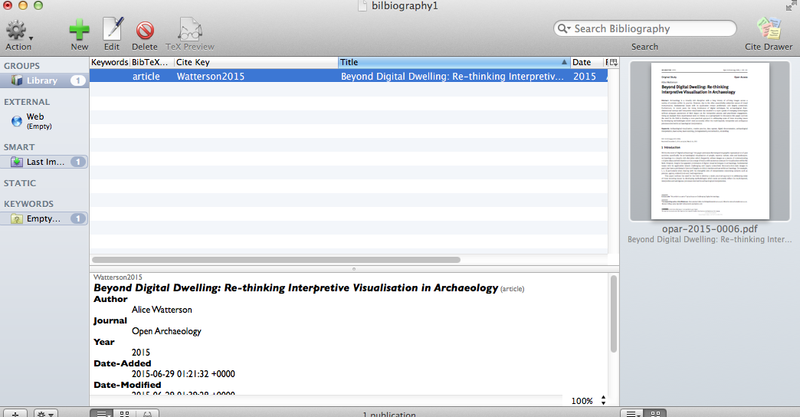 In the screenshot above, I’ve got Alice Watterson’s recent piece from Open Archaeology. My cite key is her name & the year. 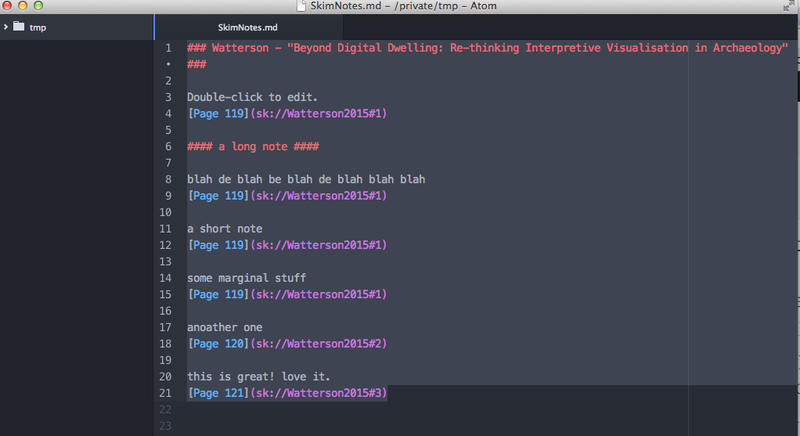 Now, in Skim, open that pdf up, and start making notes all over it. Save. Now, the first thing we’re going to do is use Sheffler’s script for making custom URLs that will link our notes to the relevant page of the pdf; these are URLs that we can then use in our Markdown documents. His instructions are at: http://www.dansheffler.com/blog/2014-07-02-custom-skim-urls/ To follow those instructions, find your AppleScript editor on your machine, and paste his code in. Save as an application. Then, find the application (he called his ‘Skimmer’) on your machine, and right click (or whatever you do to bring up the contextual menu) and inspect package contents. You then open the info.plist file in a text editor, and swap the default for what Sheffler instructs – see my screenshot: Run the Skimmer application. If all goes well, nothing much should appear to happen. Ok, so, let’s test this out. I went to dillinger.io and made the following md link: [@Watterson2015 [page 120](sk://Watterson2015#120)] and then exported it as html. I opened the html in my browser, and hey presto! When I clicked on the link, it opened the pdf in Skim at my note! So that’s part 1 achieved. Now onwards to part 2. Dan responds at http://dansheffler.com/blog/2015-07-01-electric-archaeology/ to note that the tool in question is here: https://www.pdflabs.com/tools/pdftk-server/ and runs on the command line.